If you need a big home for your family, but don't want to sacrifice the warmth and cosiness of a little dwelling, you might find inspiration in the home we'll explore today. 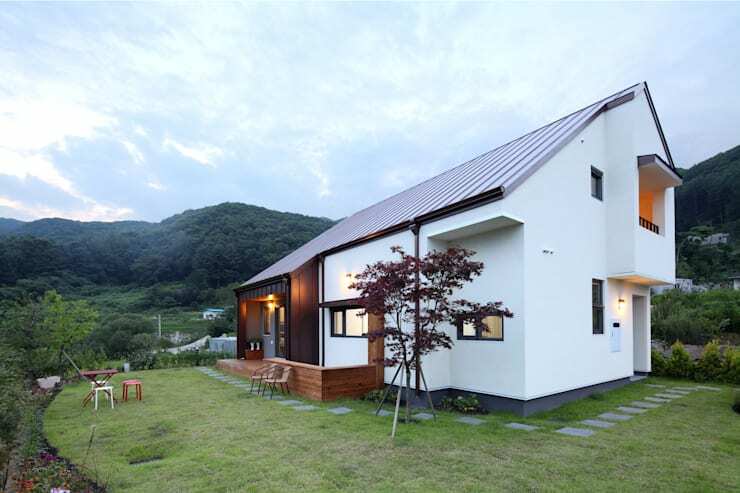 It is a two-level home with a peaked roof, wooden finishes and two very different facades. The back porch or terrace has a very simple little outdoor area. It has a roof of normal height and the golden tones of the wooden deck give it some homely appeal. The natural surroundings are quite expansive, but the designers have decided to landscape the garden with just simple stone pavers. The galvanised iron cladding runs all the way from the walls to the roof to create a seamless, unified effect. 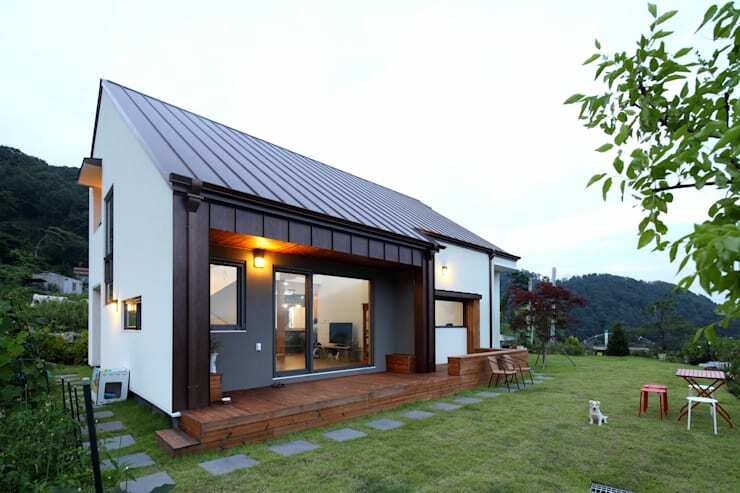 Thanks to the very steeply sloping roof, the exterior of the other side of the home is quite dramatically different. The building is quite large, but the effect is still quite friendly. 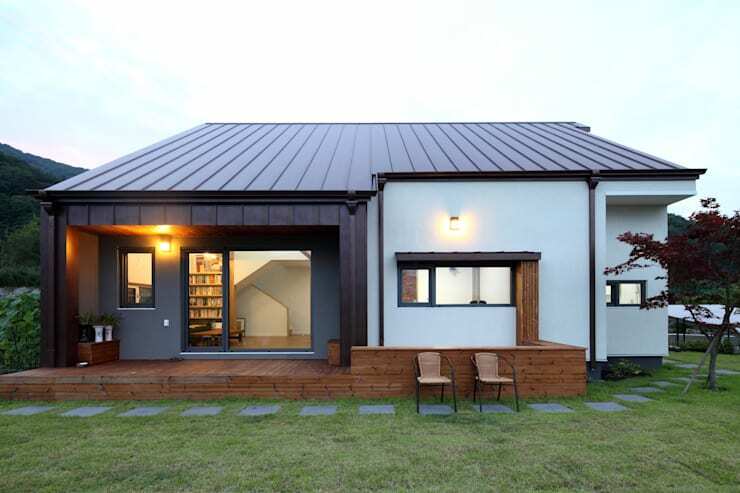 The peaked roof adds family-friendly ambiance and there are also a good variety of windows in this home; from the panel windows to the extra large window to the right of the entrance. This helps break up the weight of such a large visual mass and create interest. 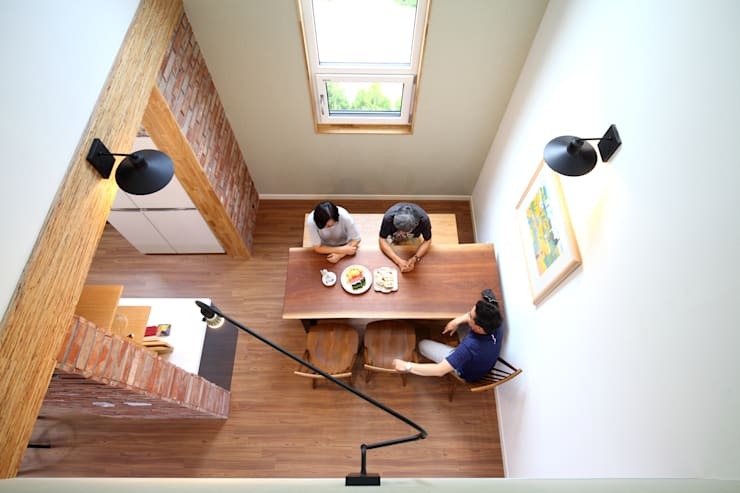 The architects have divided up the great height within the home into different sections. In the galley kitchen we see here, the ceilings are of normal height and there is a cosy, sociable feeling. The parallel kitchen benches provide a lot of bench space and they are perfectly suited to a breakfast style eating bench. This kind of kitchen layout is amenable to a social cooking experience. In the dining room or dining zone however, it's a different story. The room is of double height and the soaring ceilings become a real focal point. The great height is further accentuated by the addition of a narrow tall window. Also, note how the wooden floors and exposed brick walls give the area a lot of rustic textures and natural familial warmth. 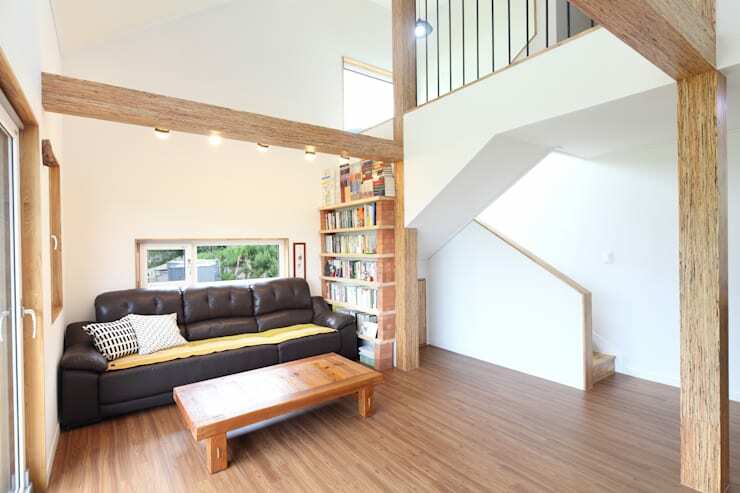 In contrast, we have a cosy living room nook with a big sofa, a built in wooden bookcase and a bright, easy ambiance. The room has good communication with the passageways and there is a big, bright and sociable feel. 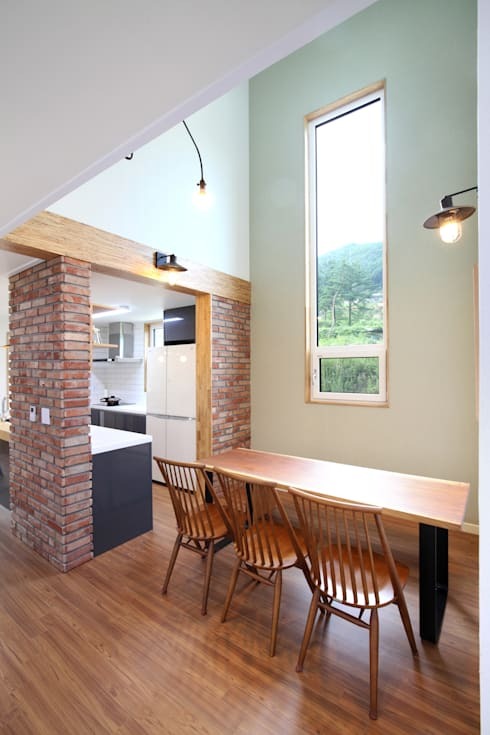 At the same time, the exposed wooden beams and wooden floors give the room some grounded appeal. On the other side of the living room we have a good view of the unique division of spaces. 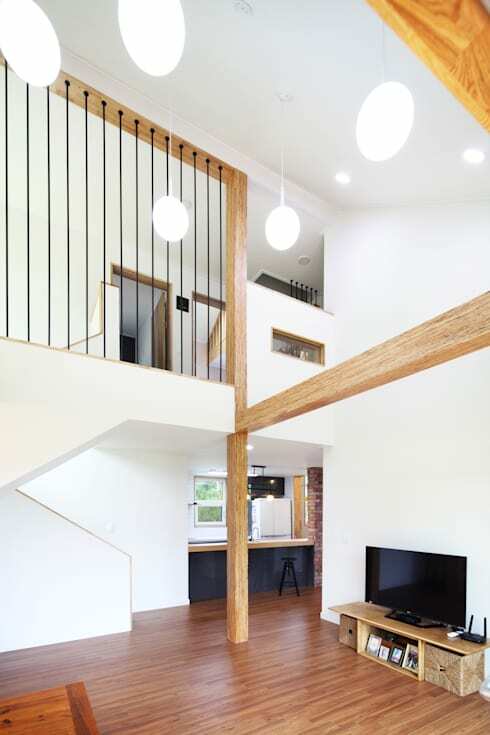 The exposed wooden beams break up the potentially overwhelming effect of such vast white walls. They also define the boundary of each area without blocking light or closing off communication between each space. 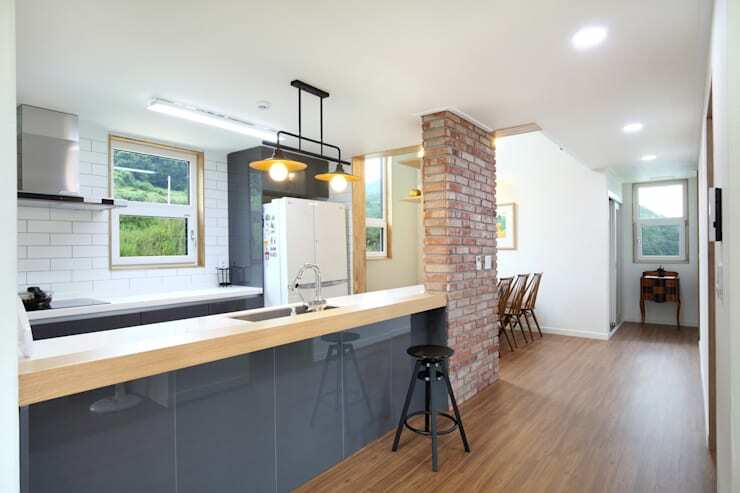 This is a careful balance to consider in a family home with an open plan layout. One of the best things about a peaked roof is the possibility for shaping your interior spaces. In this bedroom, the slope of the roof creates an instantly cosy atmosphere. 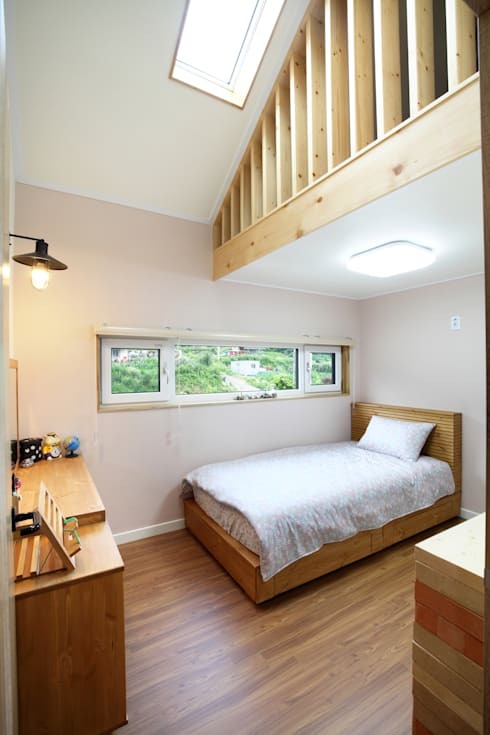 Also, note how the panel window frames the natural views without sacrificing too much of the occupants' privacy. 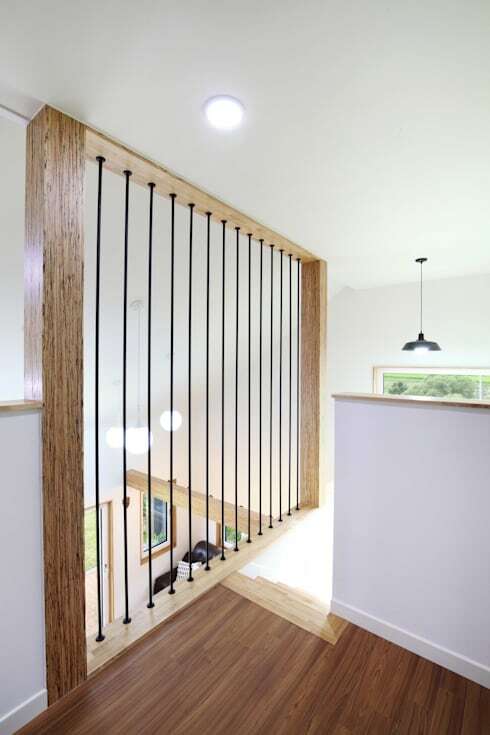 If you found this project interesting, you'll love The quiet wooden home with a modern touch. 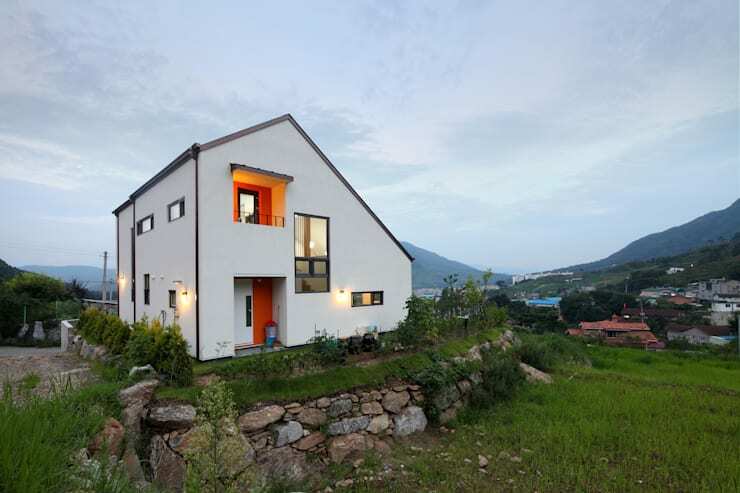 What do you think of the many facets of this home?